The tour guide told us that Japanese must have natto for breakfast. I saw this at Grand Hotel Hamamatsu and I gave it a try. 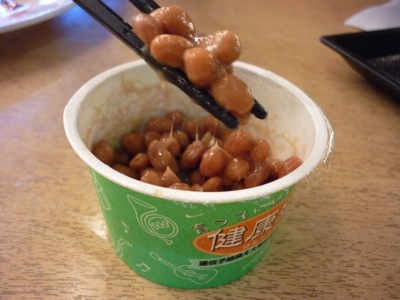 Natto is a type of fermented soy beans. Before eating, you mix the ingredients with a pair of chopsticks. Natto tends to get sticky and creates web-like threads during mixing. It tastes bitter. Japan is famous for its bullet train called Shinkansen (新幹線). And we got the opportunity to take a short ride on a Shinkansen train. 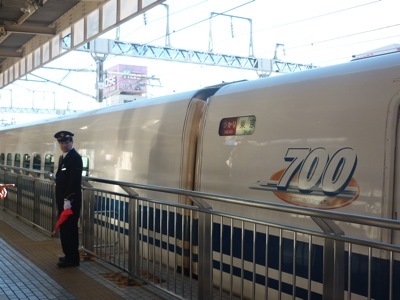 The bullet train service was introduced in the 1960s and it has a history of already 50 years. The Japanese are proud that there are no accidents so far – not even minor ones – on this line. We took about a 17-minute ride and got down at the next stop. The train is clean and quiet. We first saw the snow-capped Mt Fuji (or Fujisan as the locals call it) on the train. But it was too far for us to appreciate. 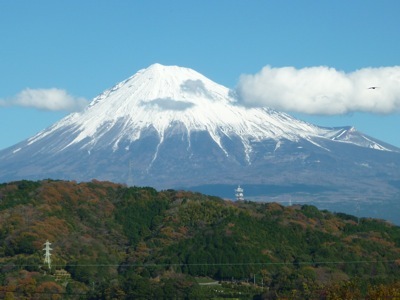 But when we were on the way to Hakone (箱根) for lunch, we were stunned by the magnificent view of Mt Fuji. It is much better from the pictures I used to see. We stopped at a rest area for a better view and photo taking. The best thing about Mt Fuji is there are no other mountains nearby that are blocking this 3,716m mountain. And no matter which angle you look at it, the highest mountain in Japan looks just the same. We came at the right time as the top of Mt Fuji was covered with snow. Majestic, spectacular, amazing, grand are the words I can find to describe this beauty. We were told that not every day we could see Mount Fuji at this R&R, depending on weather conditions. We were fortunate as we could see clearly from there. Soon after we left the place, the peak was covered by floating clouds. As for lunch, this was the first time we had sashimi as part of our lunch. Again it was more than what I could consume and every meal was very filling. I began to appreciate Japanese food as it is prepared in a healthy way. 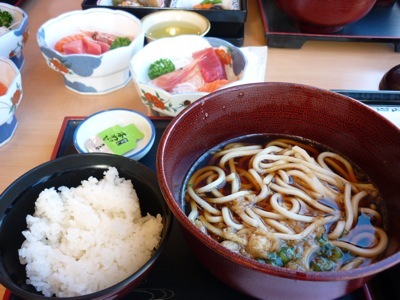 The food is either eaten raw or boiled, though they have some fried food such as tempura. But overall, the combination is just right.